The Miami Dolphins' fan base was split entering the 2012 season opener, with many of us expecting the ugly preseason view of the team to carry over at Houston and the other have refusing to let go of their blind faith that the Dolphins would keep the game close and field a semi-competitive team this season. As it turned out, us pessimists/realists had our concerned validated after the Dolphins unfortunately had quite an ugly performance against the Texans. The offense sputtered and turned the ball over; the defense only flashed decent play and gave up too many long gains; and special teams provided the only touchdown of the day. Ryan Tannehill's stat line isn't too pretty, but the reality is he didn't play as badly as it indicates. He wasn't always on-target with his passes, but I thought he did a nice job of handling pressure (of which there was plenty) and only one of the interceptions was really on him. He did best when blitzed and didn't throw downfield much, so it'd be nice to see the Dolphins take the training wheels off and let him throw beyond the first-down line more. Reggie Bush had a strong day on the ground and a did a nice job of finding holes, although he did have a bad fumble. I thought Daniel Thomas was looking good too until he suffered a concussion and fumbled on the same play, which I can excuse. Run blocking was one area the Dolphins' offensive line did okay at yesterday, so hopefully Thomas can return to the field sooner rather than later. I found it interesting that Charles Clay played quite a bit of fullback, as it was indicated in the preseason that Clay had transitioned to a full-time tight end and fullback was Jorvorskie Lane's job. Lane is obviously the better lead blocker but perhaps the Dolphins don't fully trust him yet, or perhaps the gameplan called for a different type of player at the position. The Dolphins had at least three drops on the day and the receivers didn't do much to help him. Aside from the always-reliable Davone Bess in the slot and a tremendous circus catch by Brian Hartline, the receivers struggled to get open and provide Tannehill with good targets. Tannehill didn't seem to be on-target when throwing to Legedu Naanee, but I don't know if that's a chemistry issue or just rookie ups-and-downs. Meanwhile, Anthony Armstrong had a high throw go off his hands that could have been caught, although Tannehill shares blame and needs to put it in the numbers of his wide open receiver. Anthony Fasano made a tremendous bobbling catch and blocked well as always, but he wasn't a big factor in the passing game and there simply weren't enough opportunities to go around. The Good, the Bad and the Ugly is an appropriate term to describe the Dolphins' offensive line. 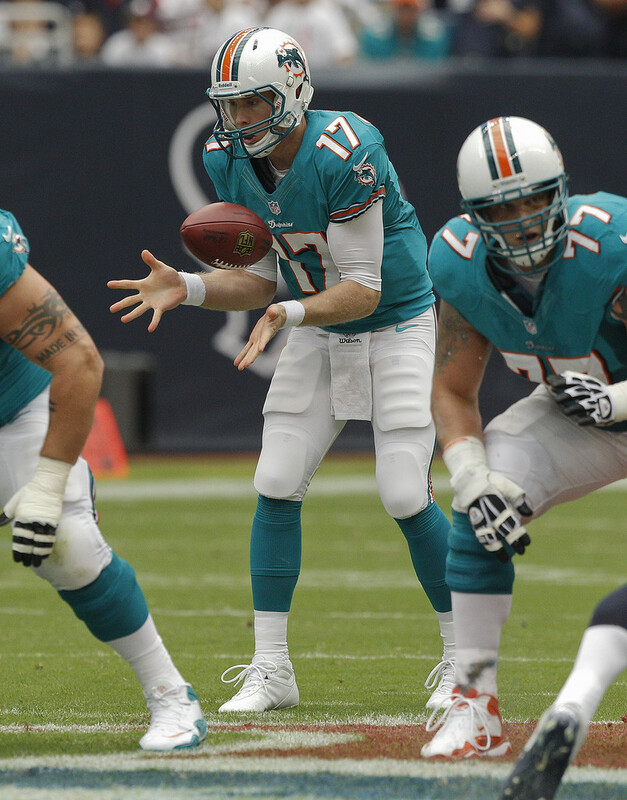 I thought Jake Long and Mike Pouncey both had very good games and I was encouraged by their performances. John Jerry was so-so but did his job as a run blocker. The goats were Richie Incognito and Jonathan Martin, who allowed way too many pressures on Tannehill. Martin also allowed a sack and the line was responsible for two of Tannehill's interceptions by not staying engaged with the guys they were blocking and preventing them from getting their hands up. The Dolphins' biggest strength on the defensive side of the ball was predictably the defensive line. Cameron Wake had a strong day with a few pressures and hits on the quarterback, and undrafted Derrick Shelby actually had two pressures in limited duty as well. But the real star here was Randy Starks, who played lights out all day and pulled more than his weight as both a run defender and pass rusher. 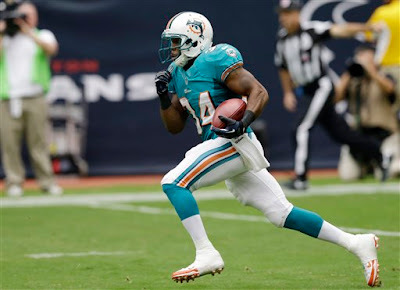 Starks is one of the few Dolphins entering the final year of his deal that truly deserves a new contract. I thought Kevin Burnett had a pretty good game and Koa Misi did well tackling, which is obviously the only thing he does well. Once again, he struggled in coverage and wasn't a factor when he rushed the passer. I've been frustrated with Karlos Dansby for a while now and he absolutely drove me nuts in this one. He was terrible in coverage and celebrated like a jackass whenever he made a stop, even if it was after a good gain by the offense and the Dolphins were down big. In two years I've gone from loving the signing (especially as an Auburn fan) to counting the days until he's off the team. Although the linebackers got picked on in coverage, the corners didn't really have good games either as both starts allowed more than half the passes thrown their way to be completed. Sean Smith had good coverage at times but made some perplexing turns, like on the touchdown he gave up to Andre Johnson. And can someone explain to me what Jimmy Wilson (a clear backup talent that I thought moved to safety?) was doing matched up one-on-one with Johnson? How the hell does that happen? Inexcusable. I thought Chris Clemons was solid even though he was late on some plays (as uggge) but I really liked how Reshad Jones played. He played the run well with five tackles, didn't give up anything in coverage and even had a pressure on the quarterback. Joe Philbin has talked him up recently and hopefully that turns out to be well-earned. Just another day at the office for Dan Carpenter and Brandon Fields. Carpenter made his only field goal attempt and Fields dropped two of his three punts inside the 20. What a nice change it is to have a guy returning kicks and punts that is actually a threat to take it back for a touchdown! Marcus Thigpen was the lone player in Week 1 to return a punt for a touchdown and he proved even more why he earned a spot as a specialist. It's exciting to see what he can do with a full season. The biased fans will point out that the game was close for a while and if it wasn't for the turnover-fest before halftime the score may have been closer, but the reality is that this game showed exactly why many of us aren't expecting much from this team in 2012 and why we're worried about so many aspects of this team. I'm certainly not down on Tannehill, but the weapons around him are seriously weak and the offensive line doesn't even seem to be halfway reliable in pass protection. I think he'll get better, but there's simply no way he's goingto win many games with the lack of tools he's working with. The defense has some talented players but still too many issues to be great. They still only have one pass rusher in Wake, the linebackers are average at best and the secondary is full of players that are still unproven or don't have a history of being highly-effective starters. I expect the Dolphins to win a few games this season thanks to their easy schedule, just dumb luck and all that "any given Sunday" stuf, but expecting them to consistently take it to better opponents is probably asking too much and this weekend's ugliness was likely only the beginning.